На данном уроке мы сравним употребление двух времен – простого настоящего (Present Simple) и настоящего длительного (Present Continuous). В ходе занятия мы научимся строить утвердительные, отрицательные и вопросительные предложения с каждым из этих времен, а также рассмотрим примеры их употребления в речи. What do you do every day? You wake up early, you wash your face, brush your hair, have breakfast, you get dressed, you study and do sports. And what are you doing now? Are you having a shower or brushing your teeth? No! 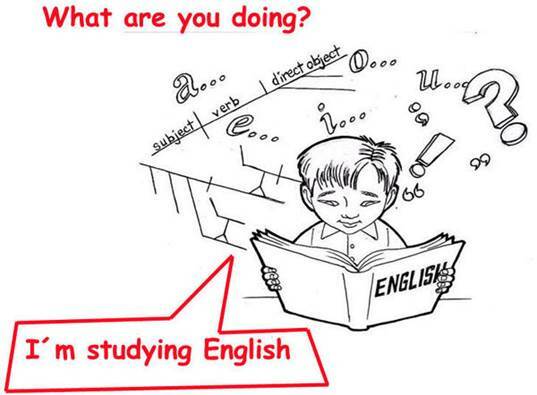 You are studying English now. Planes fly. The wind blows. Babies cry. The moon glows. The Sun shines. Plants grow. You ask me why. Don’t you know? A bell rings. Bands play. A bird sings. Wheels turn. A door shuts. Fires burn. Balls bounce. A dog barks. Cats pounce. A car parks. Pens write. A pie bakes. Teeth bite. A glass breaks. Mountains form. A hose sprays. Models pose. A frog jumps. Boxes stack. An elbow bumps. Trees shade. A cup chips. 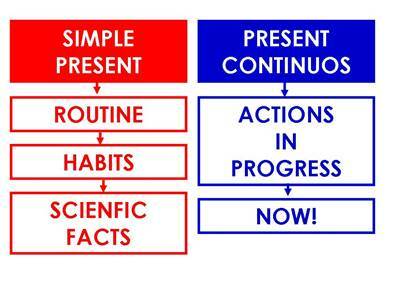 The Present Simple. It’s not hard! I am; he, she, it is; you are. Repeat, relax, and don’t be tense. 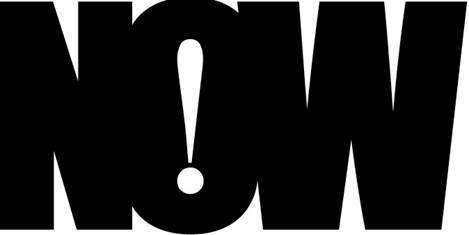 The Present Simple will start to make sense. I swim on Fridays, I am not swimming now. I make tea every morning and I am drinking tea now. Babies cry but this baby is smiling now. The moon shines but now it is not shining. He lives near the circus but now he is walking in the park. He is not listening to the teacher at the moment but usually he does. They are preparing a project about England this week and they do this every month. I am seeing my dentist today but I don’t like it. 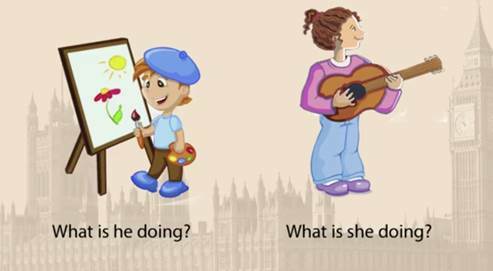 Questions in Present Simple and Present Continuous are formed by putting do/does (for Present Simple) and am/is/are (for Present Continuous) before the subject. 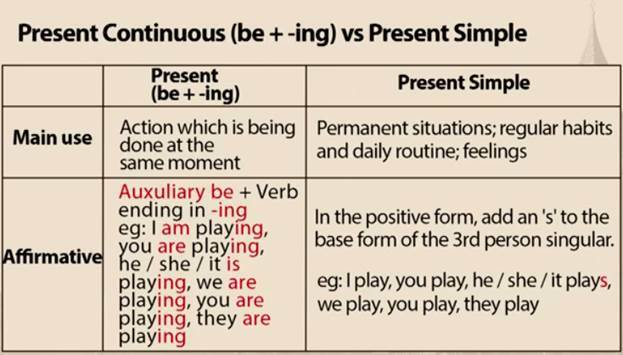 Negatives in Present Simple and Present Continuous are formed by adding not after do/does (for Present Simple) and am/is/are (for Present Continuous). 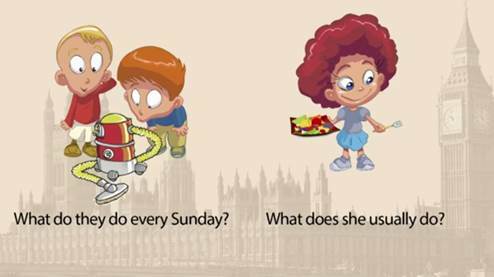 Remember: in the Present Simple questions and negativesentences we use the first form of the main verb. That we do every day! I sleep. She thinks. You eat. He cleans. 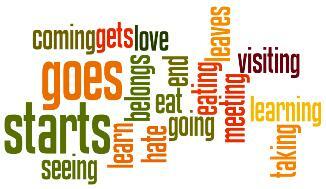 These are our habits, our daily routines! Like geese fly south and cows can “moo”! Birds fly. And they are flying now. Dogs bark. And it is barking at the moment. He likes music. And he is listening to music now. I am happy. And I am smiling at the moment. 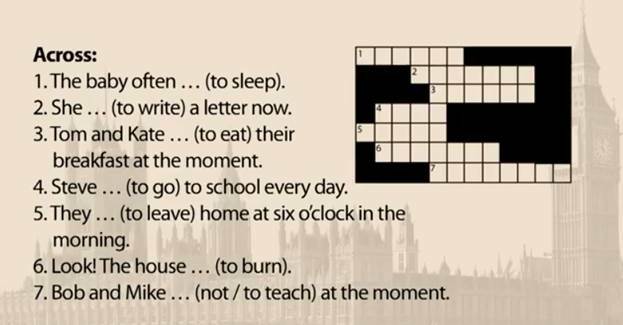 Match the beginning of the sentence with its ending. he finishes work at the space station. Then he goes to the Matrix café. is looking out of the café window at the space cars flying by. he lives on the moon. watches the same space cars, but today is different. 1c 2a 3b 4d 5e 6f. He is painting at the moment. She is playing the guitar now. She usually eats fruit salad for breakfast. She is walking. He is running. He is eating. She is drinking. She is crying. He is smiling. She is climbing. He is swinging. Упр. 180 Голицынский Ю. Грамматика: Сб. упражнений. – 7-е изд., – СПб. : КАРО, 2011. – С. 142. Упр. 181 Голицынский Ю. Грамматика: Сб. упражнений. – 7-е изд., – СПб. : КАРО, 2011. – С. 144.
а) Мой муж очень вкусно готовит. в) Твоя бабушка на пенсии? г) Учителя постоянно объясняют новые правила. д) Что твоя сестра сейчас делает? – Она стирает. е) Писатели пишут романы, а врачи лечат людей. ж) Смотри! Твоя подруга выгуливает собаку.